[One-Step Paring] The earbuds will automatically turn on and connect your smart phone when removed from the case; automatically turn off and charge when put back in the case. [HD Sound With Deep Bass] Featuring Bluetooth 5. 0 and lossless HD rendering technology that produce incredible sound quality with deep bass and crystal crisp treble. True wireless earbuds can block out a lot of surrounding noises, and do avoid wind noise created during running, biking, jogging, etc. 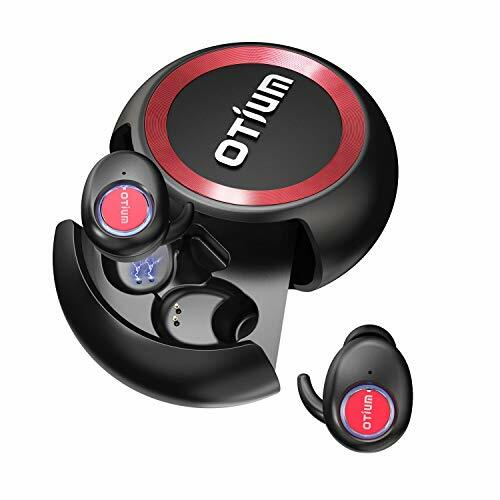 [True Wireless Experience] True Wireless Bluetooth Headphones, super light-weight (only 5 gram for each ear piece), Hassle-free listening with no strings attached, stable and seamless connectivity. The headphones also can be used to answer/reject calling, skip/play/pause songs, and activate voice assistant, such as Siri. [Charge On The Go] Wireless earbuds can last for over 2. 5 hours to 3 hours music playtime on a single charge. While on the go charging case the super musical earbuds power can last up to 10 hours. You can go for a day without power shortage thus sufficient music joy all through your day activities. [Built for Your Active Lifestyle] Ergonomic Design allows for ultimate wearing comfort to match any active lifestyle, Such as Running, Jogging, Cycling, Driving, Camping, Hiking, Gym Exercise, Business and Relaxation. IPX5 sweat proof.